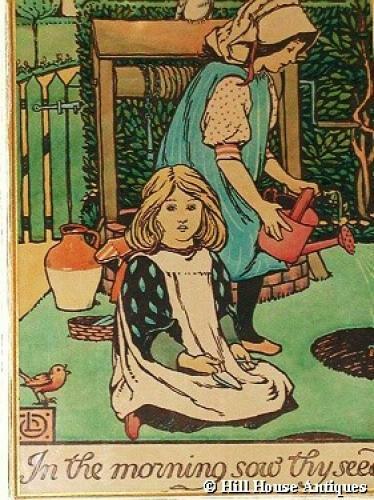 A charming early 20th C woodcut print of a couple of small girls planting - with the motto on base of "In the morning sow thy seed". Artist monogram of Louis Davis to bottom left hand corner. Louis Davis (1861-1941) started his working life in the 1880’s as an illustrator with the English Illustrated Magazine and later became a popular designer of prints which were published by the Fitzroy Picture Society and the Medici Society. In about 1890 he met Christopher Whall and lodged with him in his house in Dorking, Surrey. At this time he began to learn the techniques of glass painting. The Fitzroy Picture Society, was founded by A.H. Mackmurdo (1851-1943) in the 1890`s. It was associated with the Century Guild, also started by Mackmurdo in 1882 "to render all branches of art the sphere no longer of the tradesman, but of the artist". Associated with Mackmurdo were Selwyn Image (1849 - 1930), Heywood Sumner, Christopher Whall, Louis Davis himself and others. All were deeply influenced by John Ruskin and William Morris, and they all designed stained glass. Together,they formed an important element in the Arts and Crafts Movement. Approx 20" by 37" inc painted frame.